Access the MOLA Homepage , the MOLA Science Investigation homepage, and MOLA Data. This webpage was created for SERC by Heather Rissler and Aleshia Mueller in consultation with Greg Neumann of the Goddard Space Flight Center. The Mars Orbital Laser Altimeter (MOLA) data set consists of two years of altimetry data on surface features on Mars. MOLA data sets are produced by the MOLA Science Team and archived by the Planetary Data Systems (more info) (PDS) Geosciences Node. The Internal Structure of Mars. Image from MOLA Science Team. MOLA collects information about the shape of Mars, referenced to it's center of mass. This information is represented as altimetry profiles that are used to create global topographic maps. MOLA also provides information about properties such as surface roughness, elevation, cloud coverage, brightness, and water flow. The geomorphology of Mars suggests that water once flowed in surface channels. Knowing the shape of Mars in reference to a geopotential surface allows scientists to determine what direction water would flow. MOLA data is also used to study the interior structure and thickness of Mars' crust. The data also provide insight on Mars' Northern Lowlands by revealing shadows of giant impacts that occured before the Amazonian period. More detailed information on important discoveries stemming from MOLA data is available. The MOLA data site provides raw and derived data products. The primary repository of data from the Mars Global Surveyor (MGS) Mission is the Planetary Data System (PDS (more info) ). To access data in the PDS, visit the PDS MOLA site, or go to the PDS Geosciences node, go to Mars Global Surveyor Data, and go to instrument, MOLA. The entire dataset is large so if you want to download many files, it's easier to use FTP. Wherever you see links to data files, you may download them using your web browser's "Save Target" function. Users can also view MOLA data via the topographic map at Google Mars, which allows users to pan the map and zoom in on features of interest, including mountains, canyons, and ridges. Cartography can be something of an art form as well as literal mapping. To create images, obtain data in their binary integer, evenly sampled, simple cylindrical projection form (raw PDS .IMG files). Use a topography rendering program to apply a directional-derivative shade function and color contour function to the elevation. Software to read and extract data from MOLA PEDR files is provided for Sun/UNIX, PC/Windows, and Macintosh platforms. The MOLA Science Team web site has the same software plus versions for additional platforms. 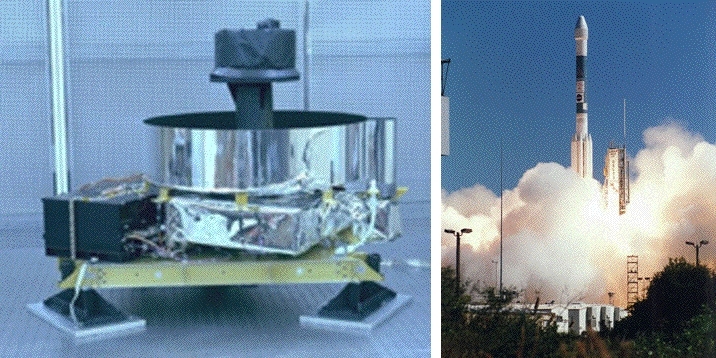 The MOLA instrument and Mars Global Surveyer launch. Images from MOLA Science Team . The MOLA instrument is aboard the Mars Global Surveyor (MGS) spacecraft that was launched on November 7, 1996. Starting in March, 1998, MGS started making pole-to-pole observations of the planet. MOLA collected altimetry data until June 30, 2001 by transmiting pulses of infrared light (1.064 um) at a rate of 10 pulses per second. Altitude was determined by measuring the time that each pulse of light took to leave the spacecraft, reflect off of the surface of Mars, and return to MOLA's collecting mirror. Error in MOLA measurements depends on the signal energy, pulse width, background level, and detector noise. By multiplying pulse reflection times by the speed of light, scientists can calculate MGS's altitude above the local terrain to within 30 meters (98 feet) or better. Knowledge of the MGS spacecraft position and the range of accuracy is sufficient to measure the topgraphy in smooth areas to an accuracy of a meter. Changes in topography due to the condensation and sublimation of carbon dioxide frost on the polar caps are measured to an accuracy of about 10-20 cm averaged over the whole of the cap. Zuber, M.T., D.E. Smith, S.C. Solomon, D.O. Muhleman, J.W. Head, J.B. Garvin, J.B. Abshire, J.L. Bufton (1992), The Mars Observer laser altimeter investigation. Journal of Geophysical Research, vol. 97(E5), 7781-7797. Kreslavsky, M. A., J. W. Head (2000), Kilometer-scale roughness of Mars: Results from MOLA data analysis. Journal of Geophysical Research, vol. 105(E11), 26695-26712. Bills, B. G., G. A. Neumann, D. E. Smith, and M. T. Zuber (2005), Improved estimate of tidal dissipation within Mars from MOLA observations of the shadow of Phobos, Journal of Geophysical Research, vol. 110(E7), 7004. Sakimoto, S. E., E. B. Grosfils, C.V. Mendelson, J. E. Bleacher (2001), The Mars 2000 Keck Undergraduate Research Project: Assessing the regional geology of the Cerberus Plains Region, Mars, American Geophysical Union, Spring Meeting 2001, abstract #ED21B-04. Ten of the many important discoveries made using MOLA data are discussed on the MOLA Discoveries page.